At Medilink International, we’re always researching ways to provide our clients with peace of mind wherever their operations are based. An area of key concern to our clients is the guarantee of an emergency alert response service in remote areas where regular A&E is not available. It is paramount that client teams are assured of rapid deployment emergency cover, particularly in the case of vehicle accidents, irrespective of whether they occur in remote or urban areas. To meet this need, Medilink has pioneered an Emergency Alert Response Service (EARS) which is installed in client vehicles and is automatically triggered if the vehicle is involved in a collision. On impact, a sensor on board the vehicle sends an alert to our 24/7 Emergency Alarm Centre, giving crucial information required for an effective response; this includes the exact location of the vehicle, the nature of the alarm and the driver’s contact details. The Centre has an open internet connection running the EARS software. The system incorporates the most up-to-date mapping of the client’s country of operation, and maintains a record of every vehicle equipped with the system’s Location Based Emergency Kit. Once the alert is triggered, the team at the Medilink Alarm Centre immediately attempt to make contact with the driver to confirm the nature of the emergency. 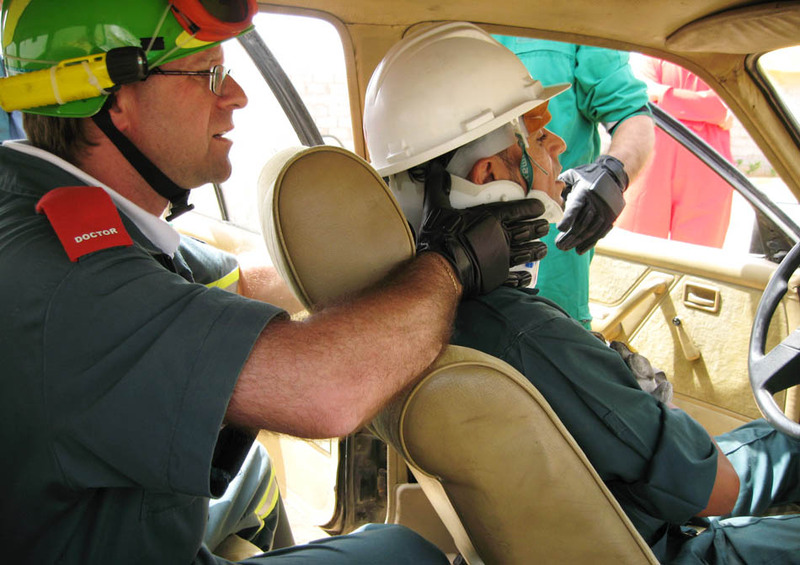 If our the response call to the vehicle is answered, our professionally-trained staff then establishes the level of medical assistance needed and proceeds accordingly. Our response services interface seamlessly with topside support if required. Should our attempts to communicate with the vehicle occupants fail, we put into action the Emergency Response Plan already in place and previously agreed upon with the client. Typically, the Emergency Response Plan would call for the immediate dispatch of an ambulance, medical team, extrication vehicle and extrication team to the location of the vehicle. Naturally, risks to client personnel while driving across remote terrains are not necessarily the result of collisions. They occur also from vehicle breakdowns or a lack of fuel, and in cases when the driver feels too unwell to continue. All these situation can result in serious consequences if they are not responded to immediately. With this in mind, we have designed the Emergency Alert Response Services to allow manual triggering using a button installed in the vehicle. Medilink can install the Emergency Alert Response Service in private vehicles or commercial fleets to ensure swift and effective response irrespective of terrain or location, whether in busy city centres or harsh, remote areas. The sytem also provides information on the vehicle’s speed and the distance traveled, which can be provided to the client if requested. This type of added information can be vital to assisting our clients in a variety of ways, including in planning routes and types of vehicles to be deployed in certain terrains and in relation to insurance claims, for example. To discuss how Medilink’s Emergency Alert Response Service can assist your operations, contact us for further details. Designed and Developed by iPoint Int. You will receive an email with new password. Please sign up for at least 1 newsletter!